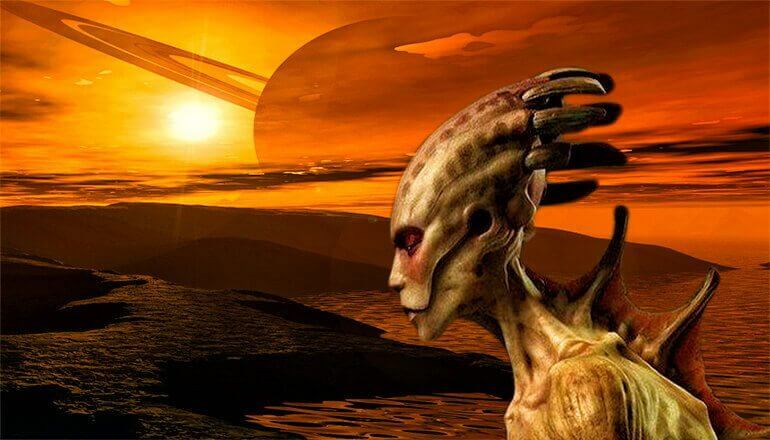 Home » DID NASA DISCOVER ALIEN LIFE ON TITAN? Whenever considering the possibility of finding alien life forms in the universe, scientists are mostly focusing their search power on exoplanets, or celestial bodies that have the optimal conditions for liquid water to form. With this rapidly growing space race, Earth’s powerful nations have scattered their probes across the Solar System in the hope of being the first to stumble across life forms outside of our planet, be it intelligent or not. One of the surprise candidates that could host alien life is Titan – Saturn’s moon that’s larger than Mercury and has an atmosphere one-and-a-half times as dense as Earth’s. This might satellite is very similar to our planet. Its surface is covered with seas, lakes and rivers that, unlike Earth’s watery composition, are made up of liquid methane and ethane. Although the nitrogen and methane present in the air are toxic for human beings, researchers suggest that other lifeforms could have developed on this particular satellite. Their assumptions are based on over a decade of thoroughly analyzing its surface using data collected by the Cassini-Huygens mission sent by NASA in collaboration with the European Space Station (ESA) and the Italian Space Agency (ASI). Cassini is not the only space probe to visit Saturn’s satellite, but rather the first to enter its orbit. Keeping this in mind, we can only think at what novel info the craft was able to gather from there, since NASA is already working on developing a submarine to explore the vast and unusual seas of Titan. Adding up to the mystery of this oversized moon, researchers have discovered an unusual feature that seems to defy any logical explanation so far. Images received by Cassini orbiter revealed how, in July 2012, a huge chunk of land measuring approximately 100 square miles (260 square kilometers) has surfaced from beneath the Ligeia Mare, one of Titan’s largest seas. On August 21, 2014, this alleged island disappeared under the shallow portion of the sea, baffling the scientific crew who were unable to find a precise explanation. Apart from this, scientists believe that a massive underground ocean is trapped within Titan, and that it could contain liquid water leaked from the frozen surface of the planet. There has been much debate on this topic, and researchers strongly suggest that these kind of underground oceans, which are scattered throughout different places in the Solar System, could give rise to alien life. A recent study of the chemical composition of the planet showed that it contains hydrogen cyanide (HCN) molecules in the atmosphere, particles which react to form polymers, including polyimine that is able to absorb a considerable spectrum of light. Snatching all this light, polyimine could be a real catalyst for life, according to various researchers. With all these unusual features of Titan and the keen interest developed by NASA and the Europeans Space Station to furtherly explore the watery surface of this natural satellite, it’s likely that some form of extraterrestrial life has been spotted and seems within reach. If they’ll find an advanced species of underwater inhabitants, or rather primordial lifeforms we can only speculate, but judging by the secrecy NASA has accustomed us to, and the unusual enthusiasm and energy directed towards Titan, is likely that something of extreme importance has already been discovered on the surface.